We got a lovely surprise in the post last Saturday morning. The postman put a little blue envelope through our letter box here at craft towers. It was the kind of envelope that only comes from one place ... 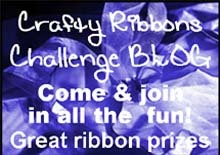 Crafty Ribbons!!! But we didn't order anything ... no no as Mum had left a comment on the Crafty Ribbons Blog saying she was bored, Ali, the owner very kindly sent us a selection of ribbons for a new challenge that she launched on Sunday 19th Feb ... we got a special preview and instant admission to the challenge, but no instructions on what the challenge was!! How special did we feel!! Our creative crafty brains automatically kicked in ... "it might be an Easter challenge" ... "maybe it's a Mothers Day challenge" ... "Or it could be a spring challenge" ... The possibilities were endless and we already had ideas of what we could do if it was any of those. On Sunday the challenge was officially launched and it was ... "baby washing" .... Ooo how we didn't expect that. So there we were Sunday morning with every one of our ideas useless ... now what?? Well there was only one thing for it ... board meeting!!! So on Tuesday, Mum, Lady and I all met for coffee and put our heads together (not literally!) and started brain storming. By the time we'd finished our coffees we had far too many ideas and definitely not enough time!! 7 hours later and almost all of our challenge goodies were complete. This time even Crusty put down her baking spoons and joined our crafty challenge!! ... wanna see??? Sorry did I not mention you can't see them before they're posted on the official challenge blog?? Ooo well consider that a bit of a preview ... I'll update you again once you're allowed to see all of our makes.